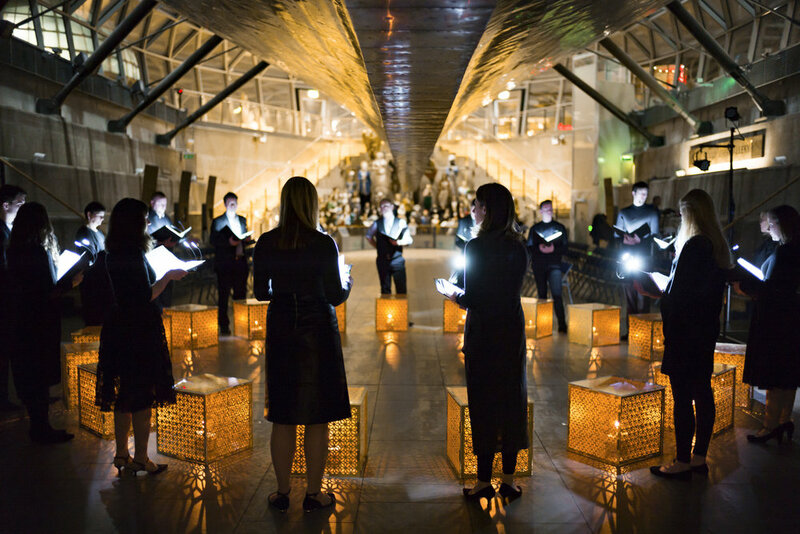 ORA PERFORMS UNDERNEATH THE CUTTY SARK! February 2017 saw the unveiling of music from ORA's next two albums, exploring light and formation to bring to life the works of Thomas Tallis and 8 living composers. Perfectly suited to his music, ORA performed at the Cutty Sark, Greenwich, just a stone's throw from where Thomas Tallis is said to have been buried. ORA performed 8 world premieres in a spell-binding concert experience which incorporated a mesmerising lighting design, by the very talented Anna Bonomelli. The cathedral-like space of Cutty Sark was filled to capacity, with an audience that responded equally enthusiastically to music both old and new. The programme featured world premieres by Richard Allain, Kerry Andrew, Ken Burton, Harry Escott, Frank Ferko and Alec Roth, whose works will soon be released on ORA's third disc, 'Many are the Wonders', as well as two further ORA commissions by Jonathan Dove and John Barber, which will feature on a future ORA disc, based around the Song of Songs.